Anyone from south india can relate what i am talking about. Potato is one such vegetable which is loved by every one. For many, cooking does not end without potato. 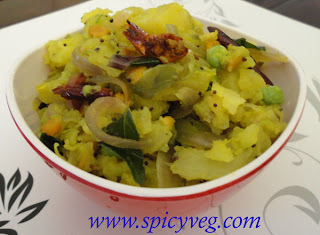 Mashed potato curry also called bangaladumpa mudda kura is purely an Andhra recipe. This curry is served in almost all the marriages in south. The easiest and tastiest curry.This tangy and spicy recipe is very simple to make and is certainly a crowd pleaser. Give it a try. Potatoes are a very good source of vitamin C, a good source of vitamin B6, copper, potassium, manganese, and dietary fiber. Potatoes also contain iron and copper. Iron is the most important component that maintains the hemoglobin levels in the body. Low iron intake causes lack of energy, dizziness, headache and anemia. Copper along with iron is necessary for red blood cell formation. Potatoes are a wholesome food and you won’t be hungry at all, for some hours, after eating potatoes. They contain carbohydrates, which is a good source of energy. 1.Boil or bake the potatoes and peel them when cool and mash. 2.Grind green chillies and ginger to a smooth paste and keep it a side. 3.In a pan, heat the oil for tempering. Add channa dal, urad dal, mustard seeds, jeera. Let the seeds splutter before adding red chillies, curry leaves. 4.Add onions and fry till light brown color. Now add ginger and green chilli paste,fry for some time. Now add turmeric powder and stir before adding the mashed potatoes and green peas. 5.Add salt and Stir until everything is mixed properly. 6.Switch off the flame and sprinkle lemon juice on the top.Garnish with the chopped coriander leaves. And there you go...Mashed potato curry is ready. Enjoy!!! If potato is so nutritional, where does the fault lie? The fault lies in the way people cook or eat potatoes. We prepare a salty, fried and fatty snack of potatoes. Your blog is so good,then provides the different kind of curries.I much like Potato Curry,Thaks for providing cooking recips information on ‘Potato Curry’.